This is a brand new replacement Binatone Style 1210 cordless phone battery. It is a 3.6V NiMH uprated battery pack and is the exact fit relacement for the Binatone Style 1210 corldess phones made for the UK market that were fitted with a 3.6V battery. 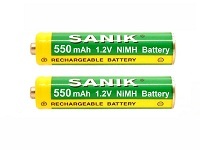 The original Binatone Style 1210 battery was either a Sanik Ni-MH Battery 3SN-2/3AAA30HSJP1 3.6v 300mAh pack or a GP30AAAM3BMX 3.6V 300mAh battery pack. This battery pack has 3 batteries that are shorter than full size AAA batteries and are 2/3AAA size. The new version has a higher capacity 400mAh when the original was 300mAh - this will give longer use and call times. When replacing your Binatone Style 1210 batteries place the phone on the charging base station and charge initially for 16 hours. Please check you Binatone Style 1210 battery is 3.6V as some models came with a 2.4V battery and this battery is NOT a suitable replacement for the 2.4V version.